I've had a peep toe bootie obsession on and off since just about about forever but recently I'm re-obsessed because of these Tony Bianco booties. 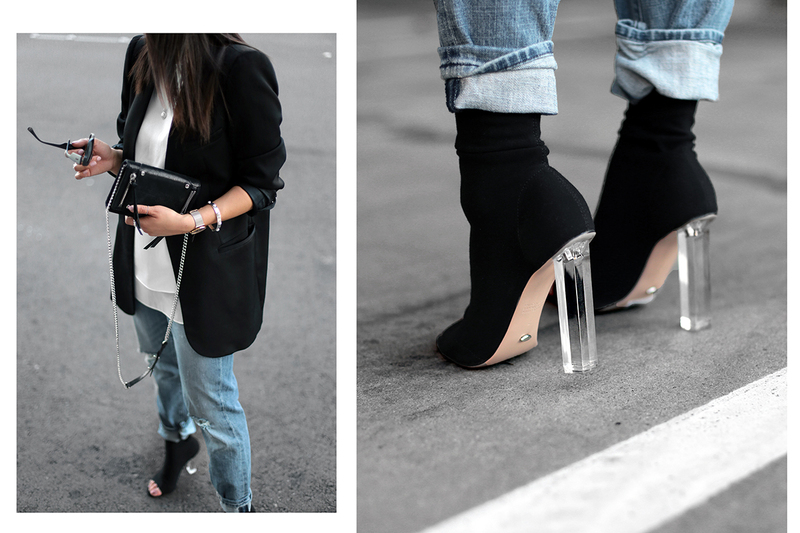 The peep toe bootie is updated with the stretchy sock-like silhouette and a lucite heel. Yup, lucite is back too. 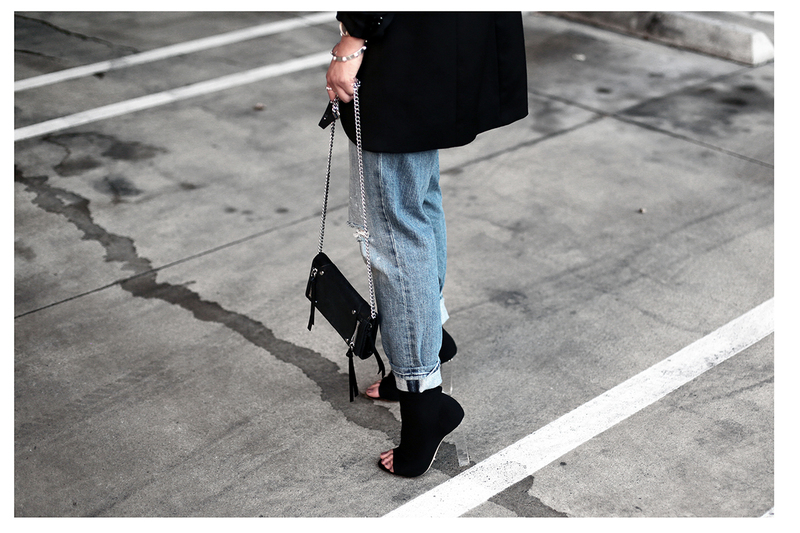 Together the combo just really updates the whole peep toe bootie idea and look. 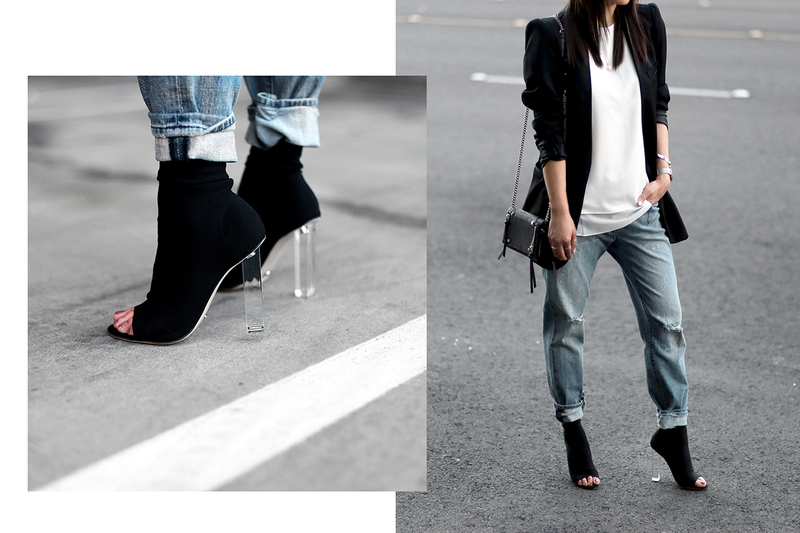 One of my favorite ways to style the peep toe bootie has always been with some girlfriend jeans (or boyfriend jeans work too). The way the loose silhouette of the jeans contrasts with the snug sock just feels so fresh. These babies also look good with shorts as I styled here on Instagram. Not gonna lie, I'm pretty excited about these. This whole look is my kinda understated cool with essentials. You know how I feel about blazers. (here & here to get caught up!) Major love there and especially when they aren't styled in a boring office manner. The Cooper & Ella top is just the perfect basic that creates an easy foundation for any outfit and I love the elongated style paired with the blazer to really steer clear of stuffy office feels. I have this in black too and love pairing it with all my outerwear. And these Parker Smith girlfriend jeans definitely get added to my fav jeans lists with the slight ripped and splatter wash. I'm definitely shorter than the pictured model and may have gotten a size slightly too big but I just love the vibe. Lastly, this Botkier wallet on a chain is so damn handy that I can't get enough. It has plenty of card slots but also compartments for a phone and another small item. I've been using it as my wallet which makes it handy with the chain for those coffee runs without carrying the whole handbag.